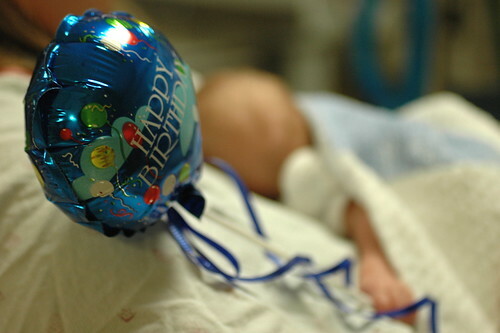 the eric update – day 62: a second gregorian birthday bath, bottle and balloon. odin celebrated his second gregorian birthday today! even though you’ll likely be reading this a day after the fact, you can feel free to hum him a few bars of the birthday song, since tomorrow will be his nine week birthday. we like to find any ol’ reason to celebrate. we weighed in at 3 pounds 9.7 ounces or about 1636 grams. it’s fun to look back at his first gregorian birthday and see that he’s gained almost exactly a pound and a half. eric got cleaned-up with a a birthday bath. while he’s tolerated his other baths quite well, for whatever reason, he decided that he was not impressed at all with this one and he squirmed and kicked and generally gave kris and nurse jan a run for their money. but rather than posting a dozen pictures of him kicking and grimacing, i’ll commemorate the event with the one picture of him looking relatively calm. 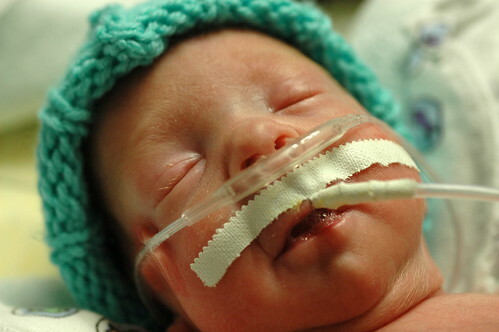 you might notice in the bath pictures that he doesn’t even have his nasal cannula in his nose! the plastic tube is gently blowing oxygen in his face to help him breath, but i don’t think he really needed to it, since it was often pointed away from his face at odd angles. nurse jan commented at one point that perhaps he didn’t need to be on supplemental oxygen at all, so maybe sooner rather than later he’ll be rid of the nasal cannula completely. eric proved that taking the bottle yesterday wasn’t a fluke; after the bath he finished off his second bottle in short order. he drank the first 16 cc’s quite quickly ( i.e. in under 10 minutes ). he then drank about 4 more cc’s over 10 minutes before deciding that he didn’t want the last couple of cc’s as he was getting very, very sleepy. after the bath and the feeding, eric barely has any energy left to celebrate and he falls fast asleep on kris’ chest while clutching his balloon. the eric update – day 54: his first “onesie”! and non-nutritive suckling! eric’s intravenous line was moved to his foot, so we were able to dress him in his very own cloths today! pooh and piglet came over to check out his new duds and compliment his on being healthy enough to ditch the hospital outfits. pooh is particularly amazed at how big eric is getting, while piglet is confused as to why the bears on eric’s shirt don’t look like pooh bears. we received the shirt from beth, a friend of kris’ who also recently had a preemie in the nicu ( thanks! ). i believe the shirt can be found at target and is one of the few preemie specific outfits that they carry in the store. it’s a little hard to tell from the picture, but he still has plenty of room to grow in clothes, which is funny because they look so tiny compared to full-term baby outfits. 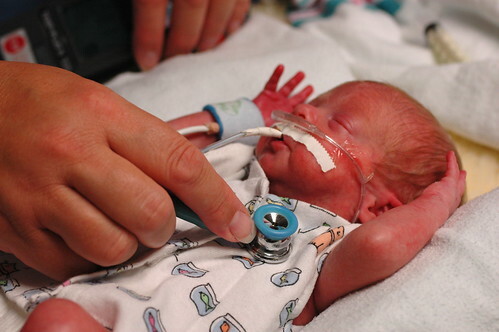 today, we reached a milestone that nicu veterans probably suspected was fast approaching when they saw the supersized paci. 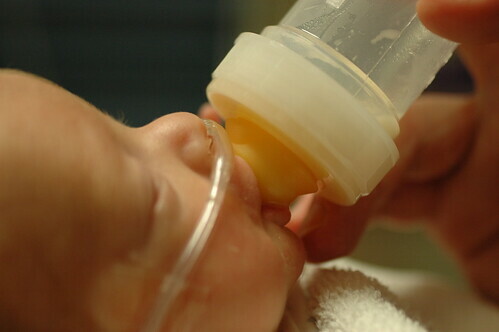 that’s right, the sometimes long and complicated process of getting a micropreemie to breastfeed has officially begun with what’s known as non-nutritive suckling. essentially, after kris has pumped ( charming phrase, no? ), she puts everything in place while eric gets a feeding through a tube. it’s the first step towards getting eric to realize that food doesn’t always come from a syringe; despite the fact that no feeding takes place, it has innumerable good side effect, from aiding in mama and baby bonding to helping kris to sustain her milk production. 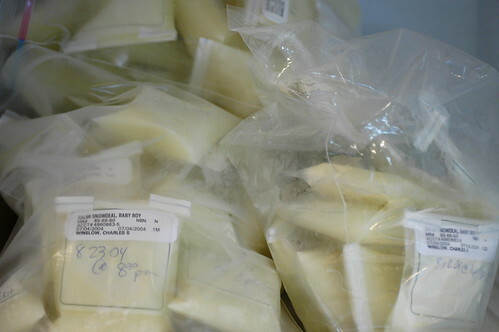 it’s not unusual after 6 or 8 weeks of pumping for milk production to begin to fall off if real breastfeeding hasn’t begun, so it’s time to start trying tactics to keep production up, since even if everything does optimally well, it could be weeks before eric is able to coordinate the complicated series of events that need to occur for proper breastfeeding. the eric update – day 52: still more postcards and gifts! 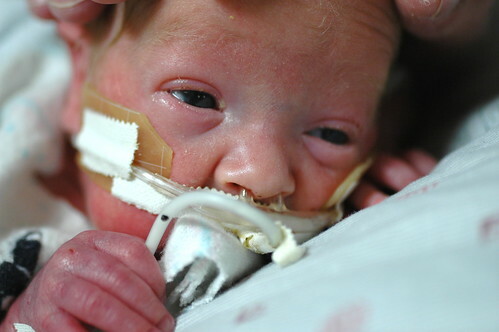 and progress, micropreemie style. today was another quiet day of making slow, steady progress. he’s increased his breastmilk feedings to 8 cc’s every two hours and appears to be continuing to tolerate them well. they will usually pull out up to 3 cc’s of undigested food before each feeding, but that amount doesn’t seem to be increasing as they up his total feedings, which is a good sign that his digestive system isn’t slowling down. 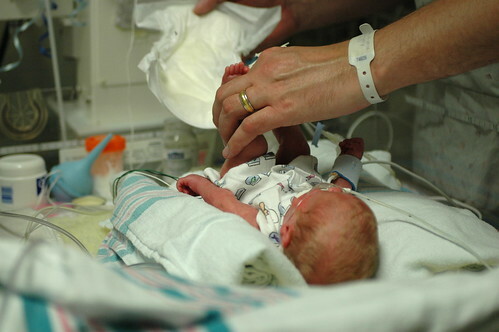 if he continues to tolerate the “bolus” feedings ( where they give him the breastmilk all at once, instead of a “continuous feed” where the milk is pumped in at a constant rate ), then they’ll keep adding a cc to the amount that they’re giving him every two hours. so tommorrow, i’d expect him to be on 9 cc’s every two hours. 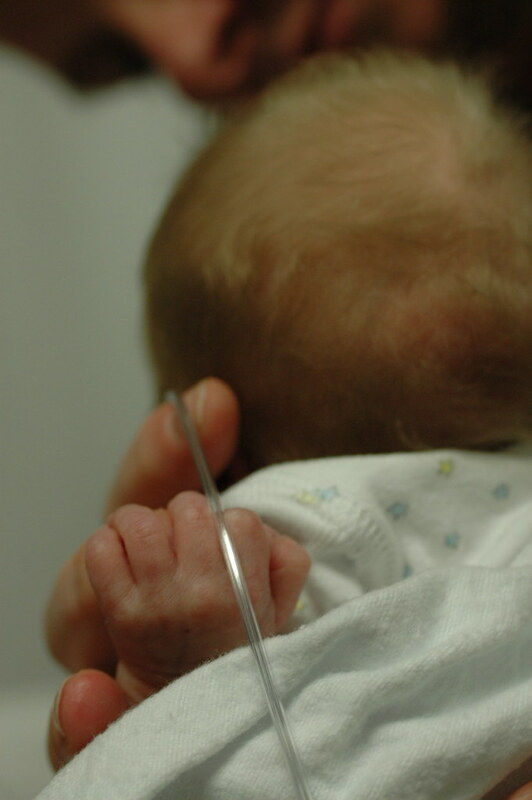 and given his wieght, he’d need to be getting about 20 cc’s every two hours to be on full feeds again ( meaning no additional parenteral nutrition from the IV ), which means he could have an intravenous line in for a ten days to perhaps two weeks. he’s having a little bit of trouble keeping a good IV and i think they might be running out of nice big veins; i suspect that sooner rather than later they might be forced to put the line in less attractive locations like his scalp. we got some more postcards! and we’ve received lots and lots of gifts lately, from friends family and strangers, and i just haven’t had time to properly acknowledge them. i’m going to put pictures of everything up as soon as i get the free time, but in the mean time, please know that we’ve enjoyed everything we’ve received and are continually amazed at the new suprises that the mail seems to bring each day. 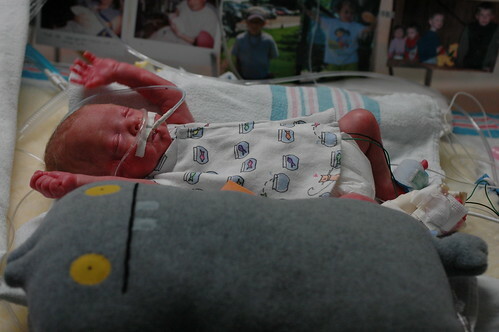 the eric update – day 51: saying goodbye to cpap. rumors of an isolette. woohoo! 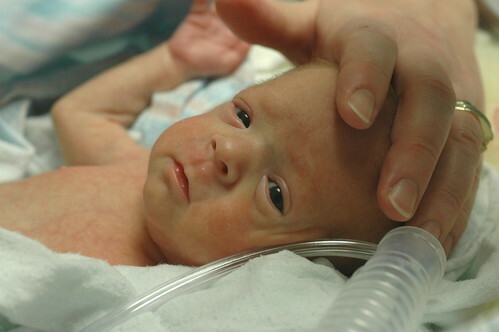 he’s on all nasal cannula, all the time! and not alarming at all. o.k. he still has the occasional apnea or brady, but they’re all for reasons that don’t particularly concern the staff. he’s on 7 cc’s of breastmilk every two hours and tolerating it well – not great, but not bad either. Every so often they’ll pull a few cc’s of undigested milk out of his stomach before they introduce the new milk; if the amount that they pull out increases then they’ll slow down his feedings. so, day 51 was a very, very good day. and there are whispers among the staff that, if he keeps up keeping up, then he’ll graduate to an isolette and ditch his radiant warming bed! amazing! sometimes a simple shot can put into perspective just how small he still is. 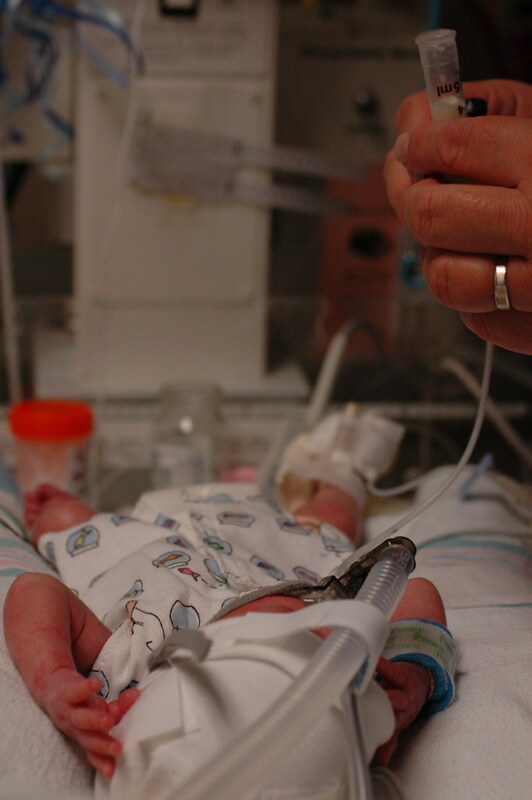 he often likes to grasp his feeding tube after milk has been introduced, which is sweet and sad at the same time. the eric update – day 48: gifts! last transfusion? no alarms (except pops induced)! there’s no doubt about it. we’re back to the ho-hum days that are mostly filled with kangaroo care. 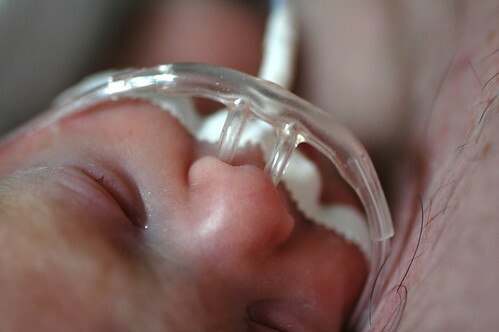 eric is being transitioned from the cpap to the nasal cannula much more quickly than previous attempts. today, they altered his schedule to alternate between 4 hours of cpap and 4 hours of the cannula. amazingly, he only had 2 brady’s (bradycardia, or slowing of his heart rate ), the entire day and both were while he was on my chest, which, of course led to endless jokes from kris and nurse jan. both brady’s were due to his head slowly getting into a position that made it difficult for eric to breath. of course, whenever eric’s on my chest he seems to enjoy putting his head in the position that will lead to a brady. i imagine that he thinks it’s a fun game to have me move his head in the correct position, only to move it slowly and imperceptibly back to the wrong one. over and over we play the game and sometimes he wins and has a brady. 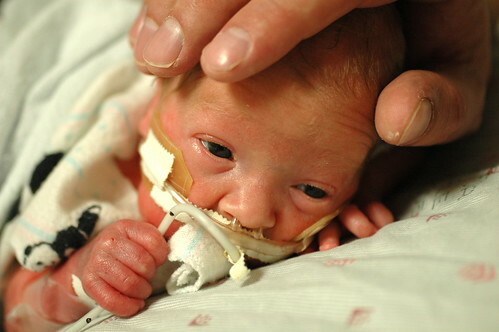 eric also likes to tug on his nasal cannula, pulling the prongs out of his nose. if he weren’t doing so well breathing on his own, we’d know when the prongs were out of his nose, as his blood oxygen levels would start to decrease. but since he is breathing so well, we don’t see the “desat” and only later discover that his prongs have been out for as long as 10 or 15 minutes at a time, which is yet another sign that he’s getting stronger. some longtime friends, matt and erin, who we haven’t seen in awhile came into town this weekend bearing gifts! 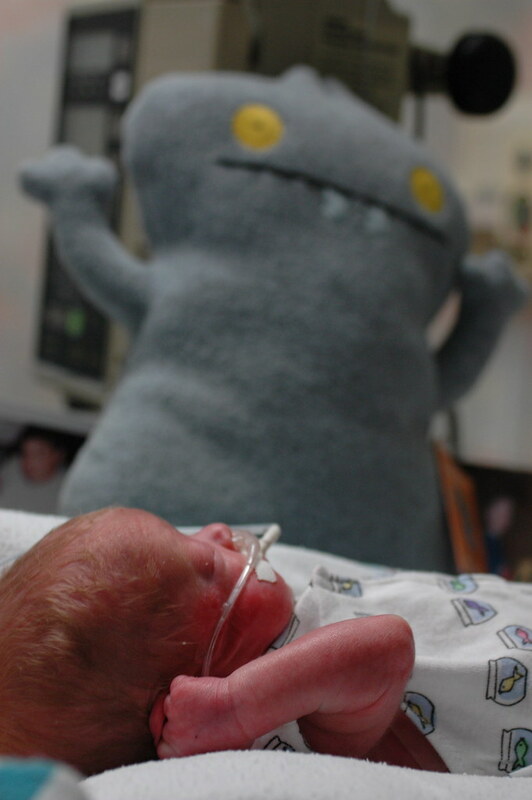 eric was happy to receive his new ugly doll, even if the nurses were all a little perplexed as to what an ugly doll was and why on earth anyone would want to buy one. but we don’t care what they think, since eric and the ugly doll got along quite famously and found themselves in long, heated discussion about which of them was taller. clearly, the ugly doll has no grounds for his assertion that he is, in fact taller than eric. in addition to giving him the ugly doll, they also gave him a cap that erin knitted with her very own hands! 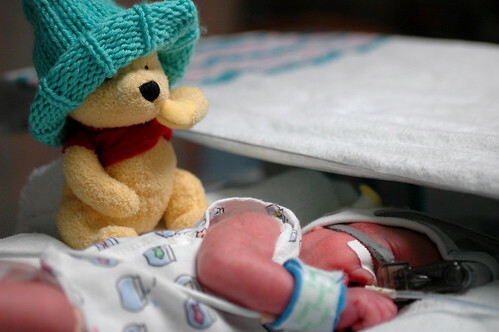 the nurses were all very impressed that the cap was knit by a nicu rookie, since it can be tough to make the cap snug, but not too snug, and it should also be quite stretchy in all directions to accomodate the various forms that his very malleable head might take on from day to day. 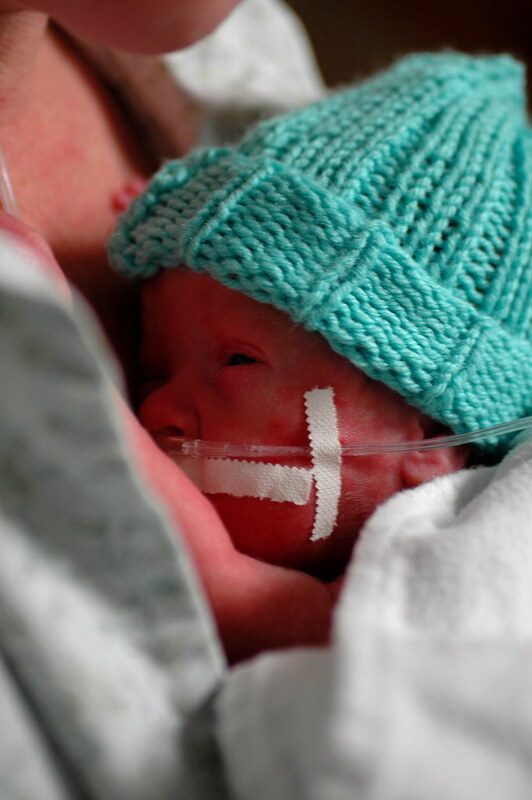 there’s a bit bucket of “discards” in the waiting room outside the nicu that have been knitted by volunteers but that haven’t passed the quality control inspection from the nicu staff, but eric’s cap won’t be in it, because it’s about as perfect as you could want it to be. thanks! there’s nothing special about the fact that i’m changing eric’s diaper, but i couldn’t remember ever providing photographic evidence to dispute any lingering suspicions that i might be trying to shirk diaper changing duties. it’s a bit more tricky to change his diaper these days, since it is seemingly impossible to not get the velcro on the diaper stuck on the shirt before you get all the cords and lines out of the way. as i change his diaper, it strikes me that as odd to think that some day we’ll actually change his diaper and not have to worry about pulling out IV or feeding lines or detaching sensors. it occured to me that i’ve only casually mentioned his intravenous feeding and having discussed at greater length a very important element of how well eric is doing. so it’s time for a short course in parenteral nutrition, where parenteral refers to food that enters the body through a blood vessel. 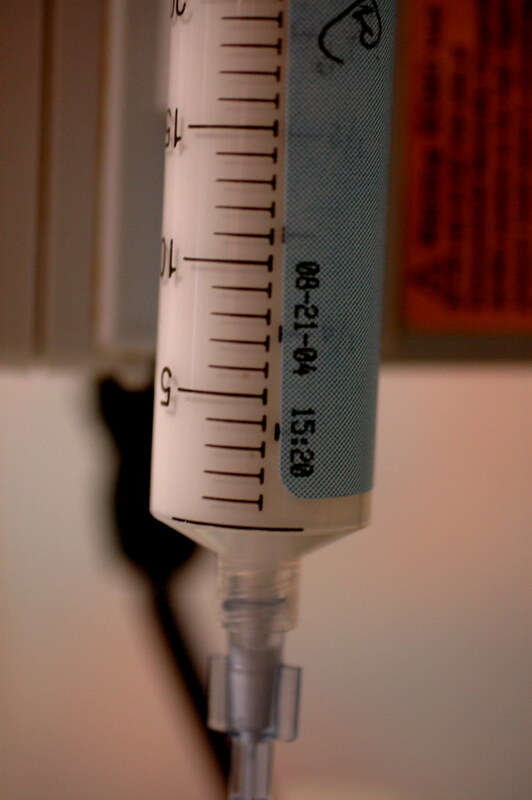 in what is known as total parenteral nutrition, all of the essentials ( carbohydrates, protein, fat, vitamins and minerals ) are delivered directly through an IV line in one of eric’s veins. 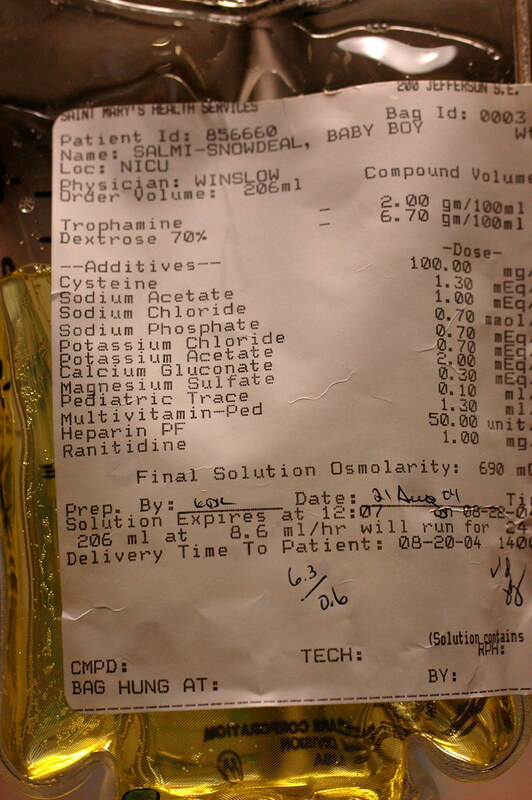 despite all the active research that has gone into parenteral nutrition and fact that it’s probably one of the greatest reasons that eric has been able to keep growing despite suffering from pneumonia, i can’t help but feel that the bag of fluids look suspiciously like gatorade and the the syringe surely must be filled with lard and not some state of the art blend of short chain lipids as they claim. eric received three more transfusions today which brings him to a grand total of 17 thus far. he needed the transfusions because he still has a hard time making new blood as quickly as he breaks it down and they’re talking a lot of samples out to keep close track his immune blood counts while he has pneumonia. 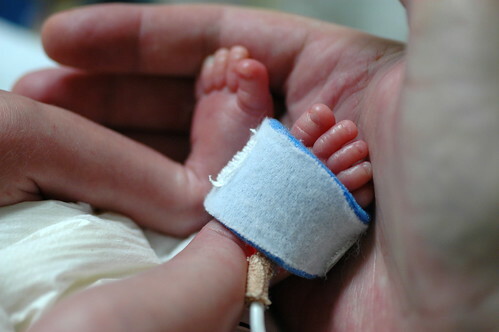 we were told today by nurse jan that, if things went as they expected, today’s transfusions would be the last he’s likely to receive during his stay in the nicu! eric’s lungs are sounding so good that it’s not really clear whether they’d still would say that he has pneumonia. in other words, he might just be fully recovered! it’s interesting to note that while we were free to explore giving “directed donations” ( where we give the blood that eric would receive ), we didn’t because it apparently takes so long to process and screen the donations that they often get the donations back after they are no longer needed. 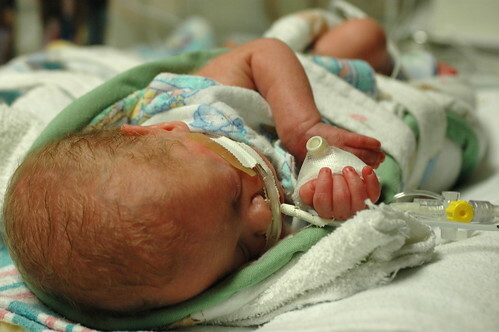 also, the screening criteria for neonatal donations is so rigorous ( i.e. can’t have any antibodies for many common ailments ) that it’s often difficult for the parents to pass the screening test. 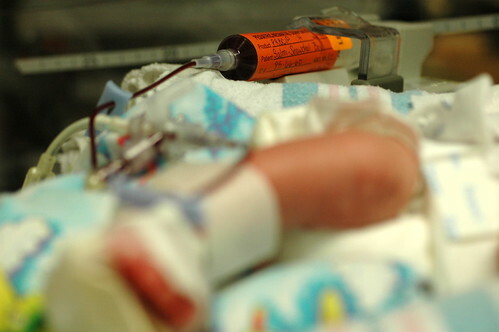 so while the staff would never prevent us from giving blood, they’ve always strongly hinted that it’s easier, safer and faster to just get transfusion from their trusted pool of special neonatal donors. 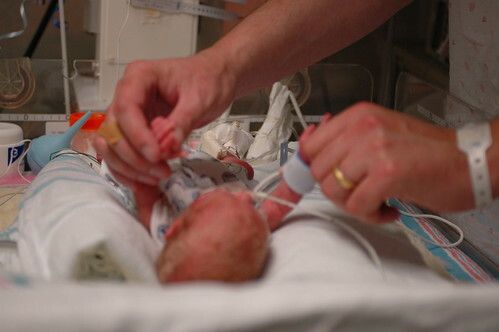 because they have to monitor his blood pressure and other vitals closely during the transfusion, there’s no kangaroo care to be had during the process. 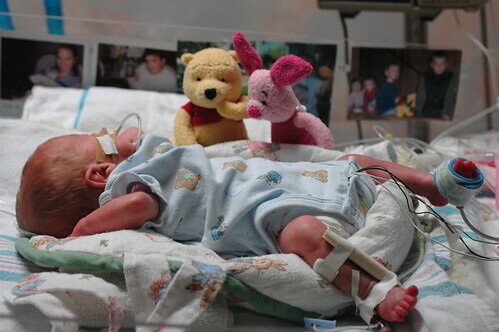 of course, kris wasn’t going to let let three transfusions get in the way of lots of kangaroo care, so she simply had to time the sessions differently than normal. 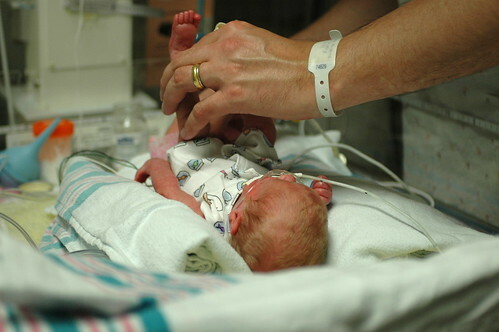 speaking of timing, while you might think that we can just waltz into the nicu and do the ‘roo, in addition to having to work around the transfusions, we also have to be aware of the nurses rounds which occur every two hours. 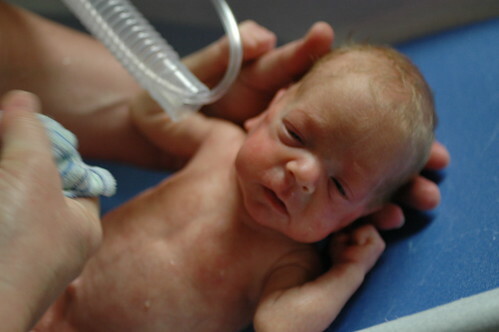 and it’s also nice to get the kangaroo care in while he’s on the nasal cannula as the cpap mask can have a hard maintaining a good fit while he’s doing the ‘roo. so there’s quite a few “knowns” that we have to deal with in addition to the usual array of “unknowns”, such as getting kicked out abruptly in the evening, just after kris had settled in with eric, to prepare for two new admits.